While the notion that Indian brides are so cheesed off about dowries that there's a Angry Birds sounding clone Angry Brides might sound humorous, the backstory is anything but. Five decades ago, marriage dowries—giving money or jewels—were outlawed in India. The custom still exists, and, according to Reuters is still so widespread that many grooms ask for more money after getting hitched. There are cases of mental and physical abuse or even "stove burnings" in which the bride is burned alive. In 2010, there are over 8,000 cases of dowry-related deaths and 90,000 cases of dowry-related abuse. 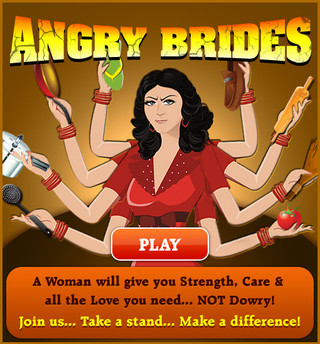 "The Angry Brides game is our way of throwing a spotlight on the nuisance of dowry," Ram Bhamidi, senior vice president and head of online marketing for Shaadi.com, a matrimonial website with two million members, told Reuters. "According to a 2007 study...there is a dowry-related death every four hours in India. We condemn this menace and have consistently run campaigns on social media to help create awareness of the issue." In the game, players dodge and hit three grooms (a pilot, a builder, and a doctor). Dowries definitely appear to be an issue worth combating, but not necessarily by a Facebook game in which women hit bad husbands with high heels, frying pans, or broomsticks. Whatever raises awareness, I guess.